Fafani, the matriarch of our family, was famous for her homemade olive oil and Harissa, staples of Tunisian cuisine. She cooked using only the purest ingredients cultivated on our family’s vegetable farm. 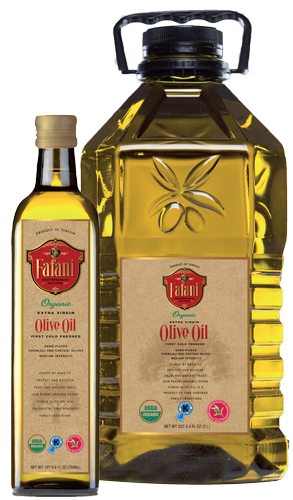 Our Fafani organic extra-virgin olive oil is a product of these traditions passed down through many generations. Olive cultivation in Tunisia dates back to the 8th century B.C. Today, during harvest season, laborers, mostly women, still climb ladders and pick olives by hand using small rakes, making the olives fall on a net below. No machinery is used to collect olives. This protects our beloved fruit and trees. Our oil is a medium intensity, with hints of tomato and a peppery finish. When you buy Fafani organic foods, you eat well, support old-world Tunisian farming traditions, and protect the earth. Enjoy! You can download our nutrition ingredients below.